Our convenient location on a quiet street just south of the State Capital building allows one to park the car and easily stroll to the Plaza, Railyard, and nearby Canyon Road. You will be close to numerous fine restaurants, galleries, retail shops and historic sites. Santa Fe is a sophisticated yet relaxed and friendly city. We extend this warm spirit to you at our inn. Our knowledgeable innkeeper can assist in planning your visit. You will enjoy our Southwestern hospitality in an intimate and romantic setting but you will also have the privacy typical of a much larger property. It’s the best of both worlds. 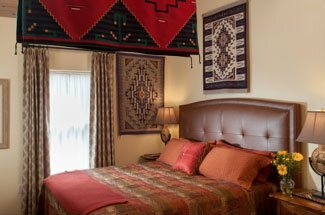 Our beautifully furnished guest rooms reflect the rich heritage of Santa Fe with its Native American, Spanish Colonial, and Frontier history. Since Santa Fe is teeming with art, our décor features the work of many fine artists and furniture craftsmen. No prepackaged breakfast entrees here! Our homemade breakfasts are prepared with quality ingredients and are varied to include Southwestern specialties and traditional fare. We work hard to offer a generous selection of items and can accommodate most dietary restrictions. Our “everything is included” pricing approach makes your stay with us a great value. We include an ample complimentary breakfast, in-room Wi-Fi, parking, quality bath amenities, and plush robes. You will also have 24/7 access to a common breakfast/lounge building where you can enjoy complimentary light refreshments or make yourself a fresh cup of coffee or tea. 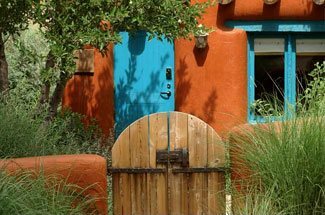 Explore our Four Kachinas rooms as we are one of the best Santa Fe, New Mexico bed and breakfasts!